Target came to my rescue! For Several years now...I have been collecting Target's First Frost Dish Collection. which I kept for myself! 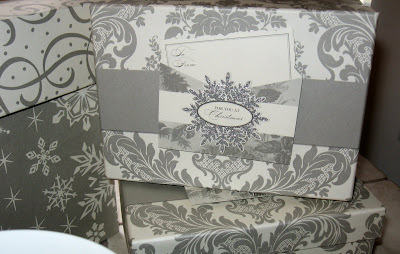 I set out these gift card boxes (From Target)...Each of my guests have a gift card for them tucked inside! I will be using these to label each of the different foods on my buffet. Ooooo ~ Donna It is beautiful here! Love how everything looks so crisp and shines! 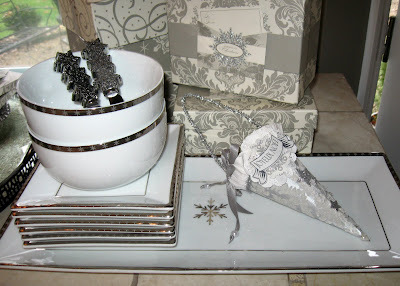 Your header is lovely and The zinc tags are a perfect addition with your beautiful silverware stockings. 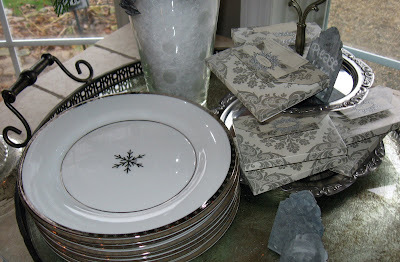 Love Target too ~ Thank you for reminding me; I have some pretty little trinkets to add to the dinner table this year...I picked them up 2 years ago at Target! That is going to be a fabulous buffet! 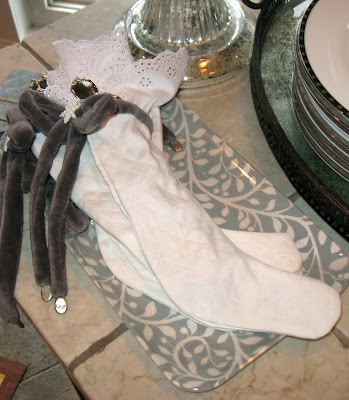 LOOOOOVE the little stockings for silverware.....darling! 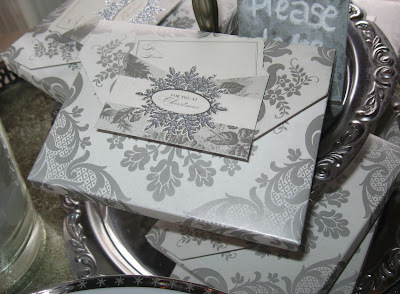 Love all the silver and white, it's just beautiful. I need to get over to Target, I haven't been for a month or so. They always have great holiday goodies. 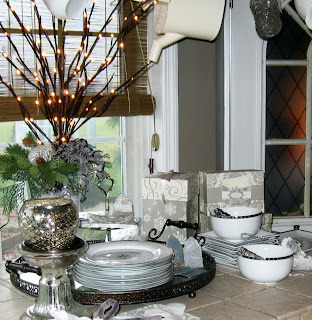 I know everyone will enjoy your buffet, you have it designed just so lovely! It all looks absolutely gorgeous! Like Rebecca said, it all flows so seamlessly, starting with your beautiful new header all the way through. I can see that I'm going to have to high-tail it to a Target! I had no idea there was such loveliness to be found there! Well Donna you have definitely achieved it, because everything is simply elegant! I adore those stockings!!! Your dishware is so pretty. I LOVE me some Target! Your header is amazing Donna! It wowed me when it came up. Beautiful! Donna! I am even more in love with you knowing that you shop at my MOST favorite store on the planet TARGET :) I never would have thought... I must say I have not once seen this holiday buffet set, it must get sold out quickly in my store. I just love it, the design is so very elegant and simplistic. I know your holiday buffet table will be nothing short of anything other than SMASHING! I hope you have a wonderful week. Donna....OMGsh! Everything looks AMAZING! Your new header, the music, and all your decorations! It was great talking with you today! I hope you have a fabulous day! Well my talented freind you've done it again! Gorgeous...just so pretty!!! BTW, I adore your new header picture...perfection!! Oh...you should see the smile on my face! 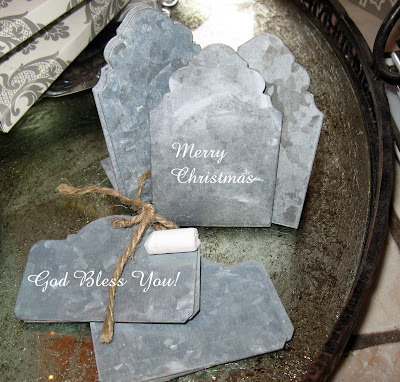 From your unbelievably beautiful Target lovilies...Dean Martin singing one of my favs...and the little snow flurries floating down...it most definately feels like Christmas...thanks for making my day! You are incredible! What a beautiful setting!!! Several years ago I began collecting Debbie Mumm snowman dishes, but they stopped making them before I finished! I found some on ebay but paid a premium price to fill out my collection! Your collection is so elegant! 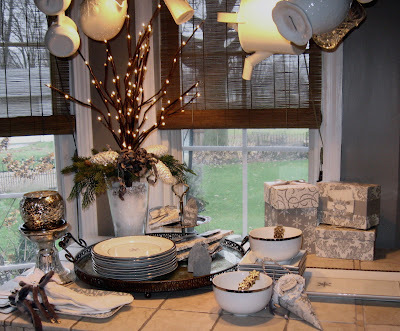 Hubby would throw me out if I bought any more dishes. Thanks so much (SO MUCH!) for all your emails and words of encouragement. So appreciated. Can't wait for 2010! Everything is so lovely Donna!! I wish there was a Target closer to me, but it is over an hour away. :( I love their Christmas items and home decor. I have not seen their Anna Griffin paper , but I know I would love it as she has amazingly beautiful pieces.